The ‘Master Gemologist’ (M.G.) program is an eleven-month training program designed to provide students with the highest-possible level of gemological education, with teachers from a diverse range of fields, including - but not limited to - jewelry design, retail, jewelry manufacturing, marketing, finance, science and IT. While today’s gemological graduates are in possession of a vast amount of academic knowledge upon receiving their diplomas, many are less well-prepared for the "real world” outside the safe and secure environment of the classroom. The M.G. program will not only enable students to learn via the traditional methods of lectures, text books and assignments, but also through genuine workplace-based experience under the guidance of an established industry professional. These mentors are drawn from an invaluable collection of contacts that have been cultivated and maintained by AIGS over several decades. The aim of the M.G. 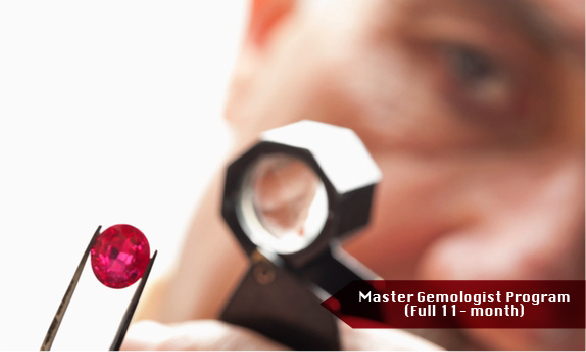 program is to immerse gemological graduates in the "real world" of gems and jewelry, while instilling an innovative spirit that will help them to make a mark on the industry in the future. By taking students outside the classroom, this program will provide them with an opportunity to engage in a real life working situations, developing survival skills and mental preparedness to enable them to better handle challenges and obstacles that they will inevitably face within this sometimes harsh and competitive industry. M.G. students will receive “on-the-job" training with companies within Thailand, or abroad, whose internship programs and objectives are in-line with AIGS course requirements. For example, scientifically-leaning students may choose to work in the AIGS laboratory to gain additional experience in the identification of simulants, synthetics and treatments with advanced instrumentation, while those more interested in the production sectors can be employed within a manufacturing facility, in order to obtain hands-on experience of the various elements of the industrial process. Other internship options - such as gem photography, jewelry sales, lapidary, jewelry design or gemological instruction - may also be available. Tuition fees are US$19,800 for the 11-month course, which includes 6 months for the regular A.G.
Past A.G., G.G., FGA, FGAA and DgemG graduates can be fast-tracked onto the final 6-months of the course in order to “top-up” to an M.G. level. The cost of this will be 50% of the total M.G. fee stated above and gemological graduates will be required to send a copy of their diploma to the registrar during the application process. Note: All fees exclude field-trip-based expenses, such as airfare, lodging, food and insurance. The purpose of the Round Table scheme is to provide M.G. students with access to many prominent gemstone and jewelry experts - each with between ten and fifty years of rich experience within the industry - who can give valuable insights based on their own past successes and failures. M.G. students will be encouraged to visit at least one gem mining locality, one major gem and jewelry fair and one diamond manufacturing and/or trading hub. As a prerequisite for M.G. graduation, students will be expected to have attended Asia's two largest gem fairs in Bangkok and Hong Kong. These two biannual events are held, sequentially, every March and September. Gem fairs provide an opportunity to see a vast number of stones in one location, which can help sharpen your eye for stone recognition and get a feel for current market trends, both in terms of availability and pricing. While such events are open to the general public, attending as part of a group of AIGS students and staff will have several additional key advantages. While classroom-based learning can teach a student much about gemstones and jewelry, nothing compares with the first-hand experience that can be gained from traveling to see the industry’s many elements in person. Note: Field trips are offered exclusively to AIGS students only. Availability is limited, so early bookings are recommended to avoid disappointment. For more information, please contact the AIGS registrar. With this in mind, AIGS is delighted to announce our new range of exciting field trip destinations, where experienced gemologists, gemstone merchants and lecturers will accompany our students to some of the industry’s key mining localities, manufacturing hubs and commercial centers. 1 Oct, 2020 - 26 Feb, 2021 Register Now!